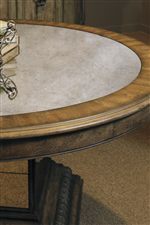 Dress up your dining room with the formal styling of the Montserrat Dining Table. The tables grand top is thick and rests on trestle base with four turned posts. 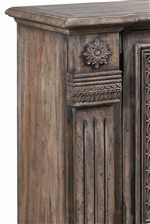 With a rich black on brown finish, the Dining Table will make a statement in your dining room. The Accentrics Home Montserrat Dining Table by Pulaski Furniture at Belpre Furniture in the Belpre and Parkersburg, Mid Ohio Valley area area. Product availability may vary. Contact us for the most current availability on this product.